Oh yeah, Mr Analogy? Well, a bacon egg and cheese sandwhich is like three jelly beans and a Scooter Pie times a Narn. I know this is looking at things the wrong way, but I can't help it: after the intensity, depth and edge-of-my-seat greatness of having just re-watched season 4, episodes like Grail and TKO and the like are comically inferior to me right now. I can see GKar'sEye's point but we must remember that at this point our beloved series had not long been born, and was only a baby finding its feet. 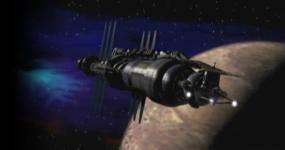 Compared to the series the pilot is quite frankly embarrasing but Babylon 5 was fated to rise above ST's episodic format and tell an emotive, galaxy-spanning saga. And as for Grail, we are all forgetting something.......BOOM! Not a stellar episode, but some of the better comic acting in the series. I didn't really see many of the classic B5 themes here other than "faith manages." Still, there were no obvious clunkers (other than our expecting to take "Jinxo" seriously at the end after working against that idea for the whole ep). Probably a good reason why we don't see anything again by Christy Marx other than fan club stuff. And as for Grail, we are all forgetting something.......BOOM! Yeah, I had forgotten that wonderful Ivanova line until I rewatched Grail this morning. I remember back when I was on AOL and we had the delightful full-time Babylon 5 chat room there, we could play sound wavs in the chat, and the "No boom today; boom tomorrow. There's always a boom tomorrow. What? Look, somebody's gotta have some damn perspective around here. Sooner or later: boom. Boom!" clip got quite a lot of play. It was just hillarious to hear it come out of nowhere in the middle of chatting. Average for me although I did like the Nakleen feeder. I LOVED the Vree lawsuit (ironacially, the one scene JMS wrote in the script due to the episode not being long enough) .. the rest of the episode was most .. skippable. Like others, the morals and the philosophy just passed over me. Hmm. I quite enjoyed the guest star, the imagery, and G'kars rockin' fun. I'd call it a B episode, but I also love "View From the Gallery" and I seem to be in the minority in that. I love the Jinxo thread, Londo's and Vir's reactions to the Feeder news, and the Vree lawsuit (with John Flinn ). David Warner's terrific. For me, this episode is between an A- and a B+.